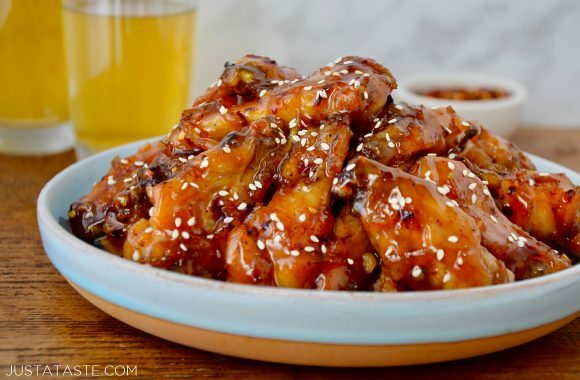 Ditch the deep fryer in favor of this quick and easy recipe for Crispy Baked Orange Chicken Wings tossed in a sweet and tangy DIY sauce. We all have our guilty food pleasures. For some, it’s sugary cereals and cheese in a can. For others, it’s frozen pizza and breakfast pastries in a box. For me, it’s food court-style orange chicken. Yep. The sticky, addicting, love-it-in-the-moment-but-loathe-yourself-after-you-eat-it orange chicken. 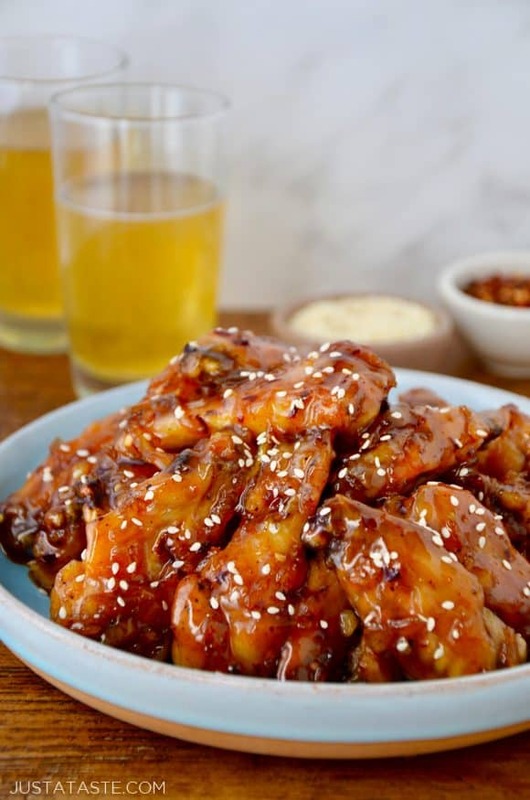 Lucky for me (and anyone else with my affinity for less than traditional Chinese food), I can now indulge in my guilty pleasure, sans the guilt, with Crispy Baked Orange Chicken Wings. Sound too good to be true? Fear not! It all comes down to ditching the deep-fryer and embracing the crisping power of your oven. 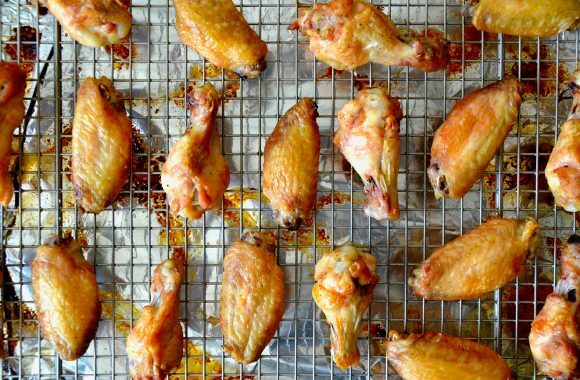 Baking the wings at high heat atop a rack guarantees that enviable crunchy, golden brown skin without all the trouble of deep-frying. For the iconic glaze, sweet orange marmalade meets its match in the form of spicy red pepper flakes sautéed with loads of fresh garlic and ginger. Now it’s your turn to dish on all your dirty little culinary secrets. What’s your guiltiest food pleasure? Craving more? Sign up for the Just a Taste newsletter for a second fresh serving of content delivered straight to your inbox each week! And stay in touch on Facebook and Twitter for all of the latest updates. Rinse wings and drumettes and pat dry. 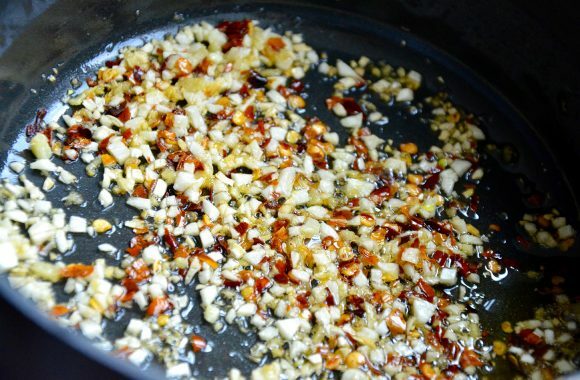 Transfer to a large bowl and toss with vegetable oil, salt and pepper. Position wings on baking racks in a single layer ensuring that wings aren't touching. Bake, rotating pan half-way through, until fully cooked, 45 to 50 minutes. Remove wings from oven and transfer to a large bowl. Add the sesame oil and olive oil to a small saucepot over medium-low heat. Add the garlic and ginger and cook, stirring, for about 3 minutes until golden brown. Add the red pepper flakes, orange marmalade and hoisin sauce, and cook, stirring occasionally, for 5 minutes. 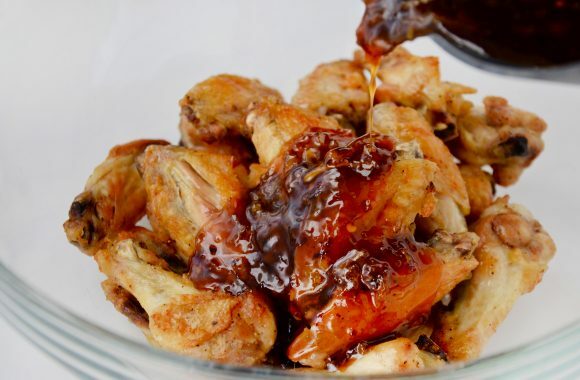 Pour the orange sauce over the wings, tossing to thoroughly coat, and serve immediately. If wings aren't your thing, you can just as easily use this glaze atop chicken breasts and tenders, as well as pork and shrimp.